I absolutely love tomatoes and am trying to grow several different varieties in my backyard this summer. It appears the love of tomatoes runs in my family. 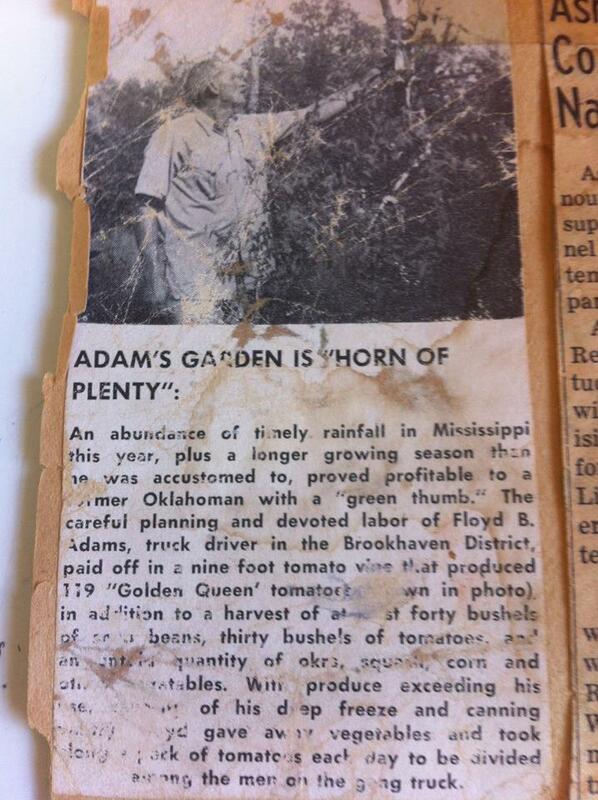 My Aunt Linda shared an old newspaper article, published around fifty years ago, of my Papaw Adams and his garden. I’m not sure which newspaper it is from, but I’ve retyped what I can make out from the photo of the newsclipping. An abundance of timely rainfall in Mississippi this year, plus a longer growing season than he was accustomed to, proved profitable to a former Oklahoman with a “green thumb.” The careful planning and devoted labor of Floyd B. Adams, truck driver in the Brookhaven District paid off in a nine foot tomato vine that produced 119 “Golden Queen” tomatoes, (shown in photo). In addition to a harvest of almost forty bushels of snap beans, thirty bushels of tomatoes and an ample quantity of okra, squash, corn and other vegetables. With produce exceeding his storage space of his deep freeze and canning tomatoes Floyd gave away vegetables and took along a pack of tomatoes each day to be divided equally among the men on the going truck. ← Out of baking powder? I wish I could follow in my grandfather’s foot steps with my tomato plants.